Balsamic chicken pasta, and reflections. Right now, all I can think about is how much I love this open window next to me. It's about 8:00 in the evening, and the sun just went down, but there is light enough to see the trees outside, with their still just-budding leaves, finally brought back to life with a jolt of sunshine after what seems like weeks of rain. There is a breeze -- not too strong, or cold, or warm, but just the right temperature that begs for an open window. I have missed this. I can hear the cars going by, each one slowing at the speed bump located right in front of my porch. I wonder where those cars are going. Something I've always wondered about, mostly on the road, in the passenger's seat, looking out the window and watching the cars pass. In every car, there is someone on their way home, or going somewhere new, or somewhere familiar, but somewhere. It's kind of the same as looking into open, lit windows at night, and wondering what stories are playing out inside. The people passing by tonight can look through my lit window and see our kitchen. There is half an onion in a Ziploc bag on the counter, along with a few pairs of sunglasses, a yellow dish towel, a graphic novel, a can opener, and small bottle of ear medication for the cat. I am too lazy to straighten up right now. I've been lazy all day. I wasn't planning on writing, since I didn't have any ideas for what to write about, or what to cook. I took a nap in the middle of the day. I woke up and felt I needed to post something. To make something, and to write something. I had an hour and a half or so left of good natural light for taking photos, so I went in the kitchen and got to work. 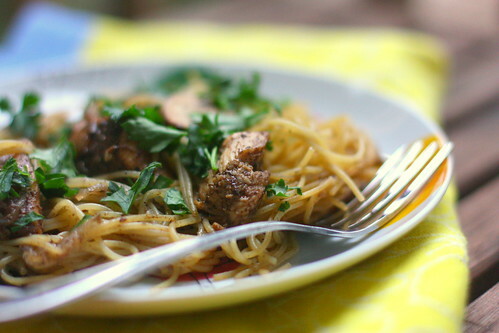 I made Shanna's balsamic chicken, not really sure what I would do with it once ready, but it's a recipe I've had bookmarked ever since she posted it nearly a year and a half ago. Has it really been that long? Shanna's engaged now (!!!) and currently planning a wedding, and I thought about that while I cooked the chicken, and about engagements and wedding planning and being a bride. How it really is a roller coaster ride, with scary drops and thrilling anticipation and an exhilaration that continues to cling even after it's all over. I'm excited for her. When the chicken was nearly done, I put a pot of water on the stove to boil. There were mushrooms and fresh parsley in the fridge. Perfect. 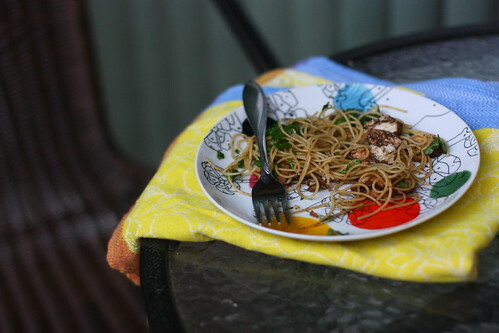 I made balsamic chicken pasta with mushrooms, and took photos of the final plate on my porch. It was good. It's about 9:00, and the window is still open. The birds have stopped chirping, and there is still a car that passes every few minutes, on its way to somewhere. One of those will be Murdo soon, coming home from work. I can't see the trees anymore. Instead, just reflections of my kitchen in the window, the refrigerator door covered with photos of nieces and cats, Post-Its with addresses and notes, Burger King coupons, wedding prints. And me, writing. I've been needing to write something. Getting thoughts on the page can be such a long sigh of relief. I feel better now. This pasta is light, but flavorful. I'm not usually big on parsley, but I think it's really important here. Also, some people are weird about reusing marinade, but I think if you boil it just enough, the bacteria gets killed and it's safe to eat. I ate it, and I'm still alive. Whisk together the first 5 ingredients in a bowl, along with salt and pepper, and add the chicken. 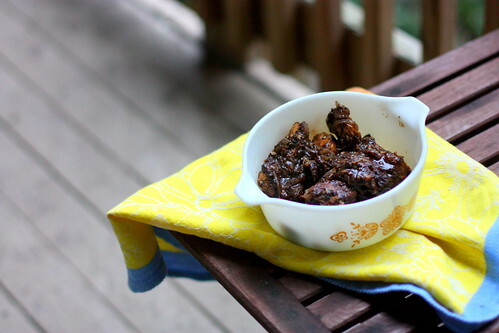 Let marinate for at least 20 to 30 minutes. Heat the olive oil in a large pan over medium-high heat. Add the onions and cook a few minutes until just translucent and soft. Remove the chicken from the marinade (reserve the marinade) and add to the pan. Cook the chicken until they start to brown and are no longer pink inside, about 7 minutes per side, stirring the juices around ever few minutes. Add the rest of the marinade to the skillet. Cook for about 5 minutes, bringing the sauce to a boil and letting thicken slightly. Remove the chicken from the pan and set aside in a serving dish, and let the sauce thicken to a consistency that makes you happy. Pour sauce over the chicken, cover dish loosely with foil and set aside. Meanwhile, bring a pot of water to a boil and cook the pasta according to directions. Drain and set aside. In the same pan used for the chicken, heat olive oil in the pan. Add mushrooms and cook until browned, about 5 minutes. Remove from heat and add cooked pasta to the pan. Add a few scoops of the chicken to the pan, along with some sauce, and toss to combine. Reserve the rest of the chicken for another use. Serve pasta with fresh parsley. Makes about 2 servings. 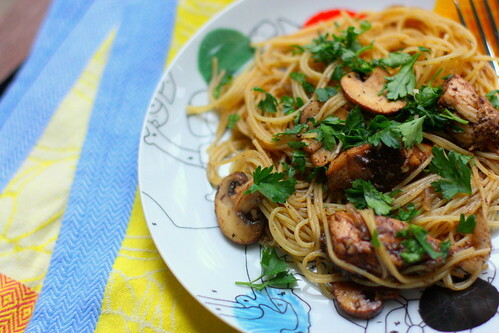 Or, you could double the pasta and the mushrooms, use all of the chicken/sauce, and make 4 servings. What a soft, quiet glimpse into those inner thoughts. Your range of writing continues to amaze me and makes me feel so proud to have such an amazingly talented sister. I'm getting back into journaling and it's eye opening to see where threads of thought go when you just write. Thanks for the post! I agree with what your sister said - you are such a talented writer. Also, I can't believe that it's been almost 2 years since you got engaged! I remember reading that post when you first wrote it. Gosh, 2 years goes by quickly! I hope you've had a wonderful weekend, Jacqui!! I'm so happy you did end up writing, as it was such a nice post to read. My eyes just welled up with tears. Thanks for letting us all into a quiet hour of your life, Jacqui—it was totally lovely. Jenny - awww thank you, I like you making you proud, Lizzie. :) Keeping a journal really is therapeutic. Since I started blogging, I haven't really been journaling that much, but I should start up again. It's a good way to organize thoughts and just let everything out sometime. Also, it's an excuse to collect cute journals! Linnea - Thanks so much! I know, I didn't even realize until after I posted this that it was two years to the weekend that I got engaged! time certainly flies. Molly - Me too, and thank you! Shanna - Aw! I miss you! Maddie - Thank you! Writing posts like this sometimes just feel more natural than trying to tie a recipe to a certain story, event, etc. I think there will be more of these to come. Jacqui -- I agree with your thought that posts like these feel more natural than trying to tie recipes to stories. I think that writing them feels less forced. I always look forward to your writing and your photographs. And the balsamic chicken? That sounds yummy. I am obsessed with balsamic vinegar so I'll have to try this before we leave. Char - Thank you! the chicken is yummy, you should try it! Nourhan - thanks for your sweet comment, and for stopping by. The recipe is super easy. Laken - Thank you! Hope you're doing well. You sound like I feel, tired :-) Hope you enjoyed your dinner. Thank you, Neil an Pretty.Good.Food! I am so pumped to try this. It's me again. I tried it and it was amazing! It was dang easy too which made me even happier. I want a Pimm's Cup.